In the British Museum, in London, there is a copy of a famous document, written in brown and shrivelled parchment. Although injured by age and fire, it still has the royal seal attached to it. It is Magna Carta – the Great Charter – which has been called “the keystone of English liberty”. This Charter was founded on an older charter granted by Henry the First. It consisted of sixty-three clauses. Many of these dealt with feudal or land customs and did not greatly affect the people as a whole, though they were important for the barons or lords and the “free” holding of land. The first clause of the Charter stated that the English Church shall be free and enjoy its ancient rights. Several clauses dealt with the conditions under which the barons held their land from the king, and granted the barons the “liberties” which John and some of the preceding kings had threatened. The “liberty” mentioned in the Charter is not the same as our modern idea of liberty. It merely meant the privileges which the barons of England enjoyed. One of the famous clauses of the Charter declared that “no freeman shall be taken or imprisoned or dispossessed unless by the lawful judgement of his peers (equals) or by the law of the land.” At that time the title “freeman” could only be applied to the free holders of land – about one fourth of the whole population. The great mass of the people in those days were unfree peasants or, as they were called, “villains”, and they lived under the rule and protection of the lords of the manors. In later times, when all Englishmen had become free men, this clause took a new and wider meaning, especially during the struggle between Parliament and the Stuart kings. 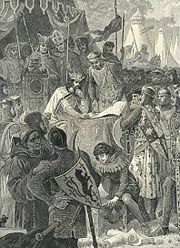 Another clause limited the right of the king to raise taxes without the consent of the Common Council – the forerunner of Parliament. The Charter protected the rights of the cities and boroughs, and gave foreign merchants freedom to travel and trade. “The city of London,” said the Charter, “shall have all its ancient liberties (or privileges) and free customs, as well by land as by water.” There was also to be “one measure for wine and one for ale, one measure for corn and one breadth of cloth, “ to be enforced all through the realm. Many of the cruel laws about trespassing in the royal forests were abolished, and the new forests made by John were to be destroyed. John soon declared that the promises won from him by force need not be kept. He persuaded the Pope to annul the Charter drawn up by the rebels against their lawful sovereign, and to command them to submit to the king’s will. But the barons prepared for civil war, and invited Louis, the son of the French king, to invade England and “pluck them out of the hands of a tyrant”. Louis arrived in London, and for a time it seemed that a foreign king would rule in England. John’s hired soldiers refused to fight against the French prince: but the barons themselves began to distrust Louis, and the national dislike of foreigners began to work in the minds of the people. While the issue was still uncertain, John died. The barons then deserted Louis and rallied to support John’s nine-year old son, Henry. They defeated Louis at Lincoln, but it was not until the men of the Cinque Ports destroyed a French fleet off Sandwich that the French prince agreed to leave England. Thus, Magna Carta was won only after a severe struggle. Rather than lose it, the barons even had the country invaded by foreigners. And although the Charter did not greatly benefit the mass of the people at the time, yet it was never forgotten. Because it bound the King of England, then and always, to keep the laws and customs of the land as his subjects had to do, it came to be called in later times “The Keystone of English Liberty”.